Come celebrate Easter at the Glendale Sports Center’s annual Easter Eggstravaganza! Saturday, April 20th 10am SHARP! 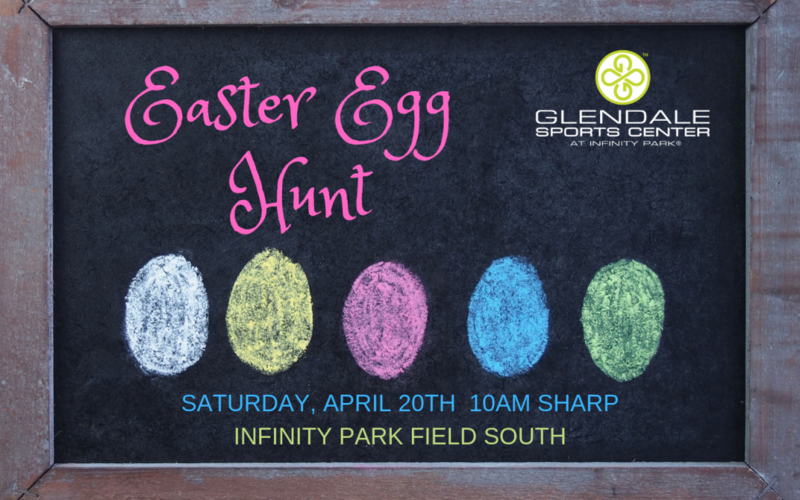 The egg hunt, for ages 0-13, will be out on the Infinity Park Field South. Bring your own Easter basket and cameras to capture all the fun. The Easter bunny will be stopping by too! Welcome two new instructors to the Glendale Sports Center! Click here to view our class schedule. Lena Wenzel has over 15 years experience teaching and leading others in fitness classes such as yoga, Tai Chi, Meditation. Aqua, Balance, Strength and Cardio, Spinning and Butts and Guts. Her specialty is Silver Sneakers. Over the years, Lena has enjoyed facilitating health and fitness in the Boulder, Metro Denver area and in Morocco where she was a cycling tour guide and fitness instructor. Sky’s classes have a meditative quality that will leave you feeling peaceful in both your mind & body. She is a calm being that allows for the movements to flow from one asana to another. Sky enjoys teaching vinyasa flow to a wide range of people, so the healing properties can be felt by all. By the end of class, you will enjoy the sensation of pure serenity. Sky is influenced by art, nature and her family. She lives in Denver, Colorado with her husband, Matt, and son, Levi. Together, they are fond of skiing, hiking, swimming, baking, and taking in the outdoors. Celebrate with us the Colorado Rockies opening day Friday, April 5th! Wear your Rockies gear or something purple to your workout on the 6th for a chance to win prizes. If you’re downtown celebrating share a picture on our Facebook page and you could also win a prize! Ever wonder what makes Omega-3s so essential to our quality of life? These unique fats found in fish are vital to optimal health and play a key role in brain, heart, weight and joint health. Fortunately, you can begin to live with vitality again at any age, by adding these important fats into your daily routine. We’ll discuss specific foods and supplements to help you live your best life yet! Major League Rugby action is going to ROCK this weekend at Infinity Park in Glendale when the Houston SaberCats come to town! Have you checked out our Fan Zone yet? The Tullamore D.E.W. Fan Zone is open to all ticket holders started at 5pm for a pre-game party – rugby style! Loads of fun, food, our favorite mascot Rudi the Raptor and our craft beer of the week Strange Craft & Wit’s End Brewing! Join us at Infinity Park in Glendale on Saturday starting at 5pm – the first 1,000 fans through the gate will get a FREE Magic Wand to spread a little “Glendale Raptors Magic“. Get a free ride and have some fun at the Mardi Gras Casino! For a $5 non-refundable fee, you receive a ride to and from the casino and a $10 play card. Deadline is May 23rd. For more information contact Kelly Cloughly. Stay active and social with group sports. The next basketball season starts April 24th and soccer season starts June 5th. Don’t have a team? Join our free agents list by contacting Kelly Cloughly. In celebration of the Easter holiday the Glendale Sports Center will be closed Sunday, April 21st. Have a happy Easter! Congratulations to Emma Simpleman, winner of the March Calorie Burn App challenge. Emma wins a nutrition prize basket. Brett Barden and Kerry Heidel are $25 gift card winners for wearing green on St. Patrick’s Day!